When last we checked in with Jarrett Williams, he was a student at Savannah College of Art & Design, and creator of the Web comic “Lunar Boy”. Since then, he’s graduated from SCAD and signed with Oni Press to publish a pro wrestling graphic novel series, “Super Pro K.O.”! Tim talks with Jarret about his take on the wrestling business, how he deals with criticism, his work process, and more. 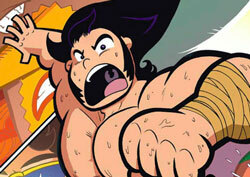 No user commented in " #259 Jarrett Williams and “Super Pro K.O.”! "